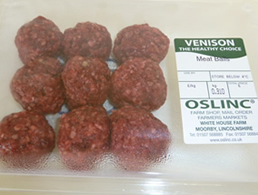 9 delicious Venison Meatballs (approx 330g) packed and sealed in a tray. Made fresh in our own on farm butchery and suitable for home freezing. A tasty treat, low in fat too.